Since I got my Instant Pot a few months ago, I’ve made all the shredded meats a girl can dream of. Beef, chicken, and of course pork. Lots of pork. There’s something about tender shredded pork shoulder that just hits that savory spot like nothing else quite can. I’ve experimented with lots of seasonings, but one of my favorites is this Sweet Habanero version. The Sweet Habanero seasoning is a sweet and hot combo that adds tons of flavor without having to measure a bunch of spices. It turns cooking something like this into a super simple meal, and it is oh so delicious. We ate it on rice the first night, but then turned it into burritos the next. I would imagine it’s pretty delectable served on a bun with some tangy slaw to help cut the heat from the spices. Next time, for sure! 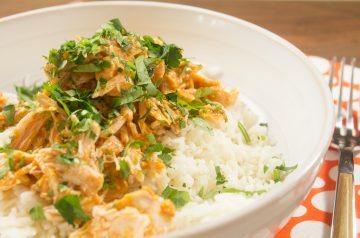 I made this in the Instant Pot, but you can definitely make it using your favorite method, whether that’s stove top or slow cooker. It will keep in the fridge for a few days, so don’t feel bad about making so much if you’re not cooking for a crowd. Season the pork shoulder with the Sweet Habanero seasoning and the salt. Add the oil to your Instant Pot and cook the pork until well browned on all sides. Add the onion, garlic, and vinegar. Add enough water or broth to cover half the roast. Set the Instant Pot to 90 minutes. When done, release the pressure naturally. Shred the pork and serve any way you want. How hot is the ‘Sweet Habanero” seasoning? What other seasonings work in its place? I don’t have a instant pot so what would be the alternative? Is the Sweet Habanero seasoning one of yours, or available elsewhere? How long will it take to cook in a slow cooker? Should I use the same amount of liquid? Can I use pork loin instead of a shoulder?